Print your logo onto these custom printed cotton drawstring gift bags or one of our other innovative pouches and small bags and use them in your next marketing campaign as a unique giveaway item. Present your little products in the perfect packaging! Leave a lasting impression and stay in your customers memory. These small gift bags are the perfect accessory on one hand and a protection layer around your treasures on the other. They come with your brand all over and a bright full colour printing on both sides. Dimensions: H 90mm x W 85mm. Custom brand these eva sunglass cases or one of our best-selling promotional pencil cases & pouches»pouches and small bags with your company logo! 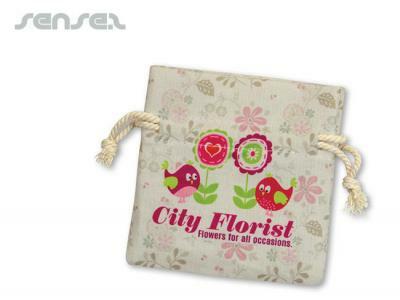 Personalise your cotton drawstring gift bags or custom design pouches and small bags for your marketing campaign. How can these unique promotional cotton drawstring gift bags or our personalised pouches and small bags fit in with your marketing strategy and help you maximise your brand exposure? Our custom made Cotton Drawstring Gift Bags can be produced from a minimum quantity of 50 pieces. We can have your logo branded on these corporate Cotton Drawstring Gift Bags in Full Colour Digital Print. A setup fee of AU$180.00 will apply to make the film.